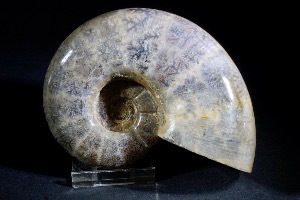 Lytoceras, meaning 'loose or unbound horn’ is a spices of Ammonite which lived in deep waters, around the Early Jurassic to Late Cretaceous 200-70 million years ago. Lytoceras has an evolute growth pattern, meaning that all of it’s whorls are exposed and not enveloped or grown over later, younger ones. The thin, often widely separated ribs are characteristic of it’s group, the Lytoceratidea. 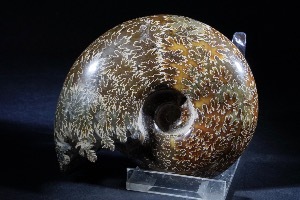 By observing the flow of water around models of ammonite shells in flow tanks, researches have shown that fine ribs such as these reduce drag - the resistance of water to objects moving through it. The ribs, therefore, make the animal’s swimming motion more efficient and ease the effort of moving a bulky shell through the water.